You’ve paced up and down the greeting card aisle a dozen times, and you still can’t find the perfect one! Have you considered the possibility that no card company can possibly hope to match the level of creativity in your own brain? Why not make your own perfect cards with today’s discount software promotion, iGreetingCard Holidays? iGreetingCard Holidays offers over 100 templates that let you easily create customized greeting cards for holidays and special events. With iGreetingCard Holidays, you’ll be able to produce your own highly original cards to celebrate Mother’s Day, Easter, Valentine’s Day, Thanksgiving, Christmas, New Year’s, and so many more. Basic editing functions mean you get exactly the greeting card you want – drag, zoom, and rotate card elements. Throw on a border, a colorful one with shadows! Customize the background with colors, patterns, gradients, or your own image. 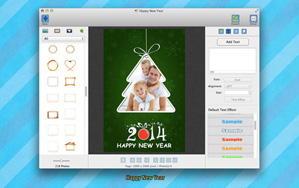 If you like what you’ve come up with, save it as a iGreetingCard Holidays project to use again and again! Your completed masterpieces can be exported in a variety of image formats, suitable for emailing as attachments or printing out. After you purchase iGreetingCard Holidays it may be used indefinitely. iGreetingCard Holidays is licensed per user, so if more people are going to use iGreetingCard Holidays you will need to purchase additional copies. Watcher1924 Do we have to activate it while the promotion is active? Jane swift Thank you for interest in iGreetingCard Holidays. The license can be used to activate the app any time you wish, even when the promotion is ended. Yes, the giveaway is only for Mac version. Karl Stading I love this free or lower prices that I get with BitsDuour. I haven't been using it that much but what I have collected is very cool. Jane swift We Softease are glad that you like the iGreetingCard Holidays. Just enjoy and make your own greeting cards. Rescale your photos without rescaling your subject!